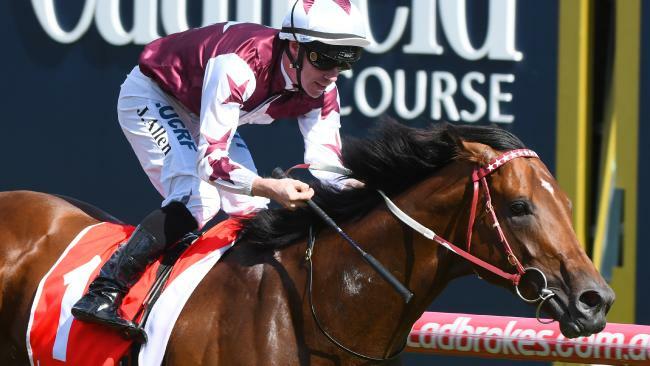 Darren Weir's belief that three-year-old colt Cliff's Edge's class would shine through was proved correct when he took out the Manfred Stakes at Caulfield. Weir said in terms of fitness Saturday was like a barrier trial for the colt, as he needed the run. Weir said Cliff's Edge, who was competitive in the Mackinnon Stakes at his last start, would have his next start in the C.S. Hayes Stakes (1400m) before he tackled the Australian Guineas (1600m). Weir said Cliff's Edge had come back to racing a better horse this time in as he was better physically and his action had improved. He said he would head to Sydney later in the autumn for the Rosehill Guineas. Cliff’s Edge returned with an impressive win in the Manfred Stakes. Meantime, trainer Nathan McPherson will stick with his plan to not throw his brilliant sprinting mare Eurack into the deep end despite her taking her record to four wins from four starts. McPherson is keen to try and keep her winning record intact. McPherson, a roof tiler by trade, broke his elbow in an accident six weeks ago and thanked his friends who rallied around him and helped him to train the mare. McPherson has selected a Benchmark 84 at Flemington on March 3 for her next start. RANK outsider Lady Esprit spoiled the party for punters when she came from last to win the W.J. Adams Stakes (1000m) at Caulfield, running down the odds-on favourite Snitty Kitty. Snitty Kitty ($1.75) took up the running from the start, but tired in the closing stages and went down by a long neck. 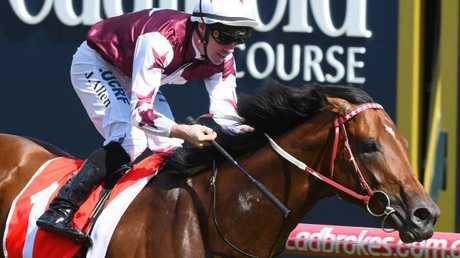 Her jockey Beau Mertens said her fitness just gave out in the closing stages. 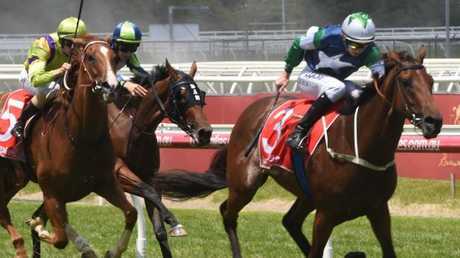 "She's set for the Oakleigh Plate and she was going in just a little short of her best - and that's what told in the closing stages," he said. "I was happy with the run. She was just vulnerable in the closing stages." Trainer Aaron Purcell said Lady Esprit, who started $51, only ran because there were no other options. Lady Esprit powered home to beat the hot favourite Snitty Kitty in the WJ Adams Stakes. "I didn't want to take on Snitty Kitty, but she's a 1000m horse and with her ratings we didn't have a lot of options," he said. "She's quite a good fill - we thought the speed in the race would suit her swooping style but we weren't sure she'd be good enough. "We were hoping she could run in the first three so she could get black type next to her name - winning is a bonus." Purcell said he didn't have any plans for Lady Esprit. "She might have a few days in the paddock then we'll sort out her options," he said. Her jockey Regan Bayliss said everything worked out perfectly. 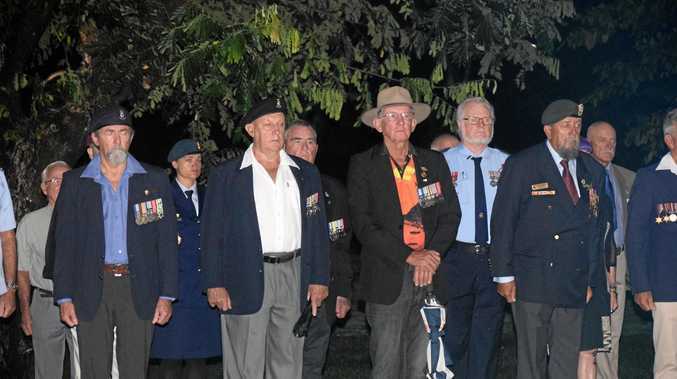 "She was very well weighted and as she gets back we needed everything to pan out perfect­ly," he said. Lady Esprit ran her last 200m in 10.99 seconds to come from last. Nasdex, who was heavily backed from $7 into $3.90, ran third. HENRY Dwyer also kept the undefeated record of his three-year-old filly Paris Rock intact when she made it three wins from three starts with her win in the Ian Miller Handicap. Dwyer said he has been surprised by Paris Rock's constant improvement. "When she won her maiden I thought that might be it so then we threw her in a Benchmark 64 against older horses, which she won, then she's kept the improvement going for today." Dwyer thanked his staff at St Leonards for preparing the filly as he said with the recent increase in his training numbers he hadn't been able to get down there. 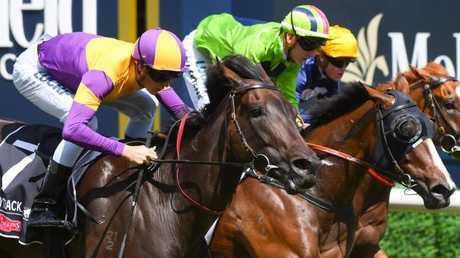 Paris Rock maintained her unbeaten record on Saturday at Caulfield. ROBBIE Laing believes Double Bluff is on track to make amends for his luckless run in last year's Adelaide Cup this year. Double Bluff proved Laing's confidence was spot on when he won the Robert Hunter Handicap (2400m) on Saturday. Last year Double Bluff finished second in the Adelaide Cup but Laing said the stayer was luckless, as he kept running into dead ends. Double Bluff was the third consecutive winner for Laing between Friday and Saturday - he also won with Zanahary at Moe and Cuban Fighter at Moonee Valley. THE winning run of the $700 galloper saved from the knackery Captain Material came to an end when he was just beaten in the opening race at Healesville on Saturday. His trainer Robert Kingston proved picnic horses can graduate to win in the city as he won with Midas Man at Moonee Valley on Friday night. Midas Man was ridden by jumps rider turned flat rider Clayton Douglas, and it was his first winner. KERRIN McEvoy has made a spectacular return from being sidelined with a broken hand. He came back on Friday night with two rides without a win but he rode the first three winners for Chris Waller at Rosehill scoring on Charlayne, Performer and Fiesta and then made it a quartet of victories when he won the last on Don't Give A Damn. 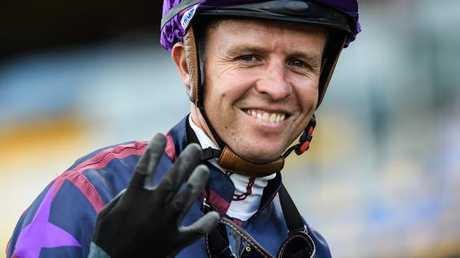 Jockey Kerrin McEvoy didn’t take long to find the winner’s circle after returning from a broken hand, snaring four winners at Rosehill on Saturday. ROBBIE Laing has finally got his wish and found a stud for his sprinter Lord Of The Sky, who will stand at Kingstar Stud, Denman in the NSW Hunter Valley. Laing said the stud had already committed 90 mares to him for his first season. He said Lord Of The Sky could run in next Saturday's Orr Stakes or wait for the Newmarket Handicap. HOW badly did last-start Flemington winners run at Caulfield on Saturday? They included four well fancied runners who never looked like winning. They were Twitchy Frank ($2.50 - 5th), Last Week ($2.30 - Last), Willi Willi ($3.10 - 7th - $3.10) and Malaise ($4 - 5th). One For Later also finished seventh at $41. Earth Angel (Great return from the daughter of Miss Finland). Sheriff John Stone (At least over 1400m). TWITCHY FRANK - Apprentice Ethan Brown told stewards his mount raced flat and may have come to the end of its preparation. A post race veterinary examination failed to reveal any abnormalities and a swab sample was taken for analysis. WILLI WILLI - Craig Williams reported that the gelding was unsettled pre-race and over-raced through the early and middle stages. A post race veterinary examination failed to reveal any abnormalities. BRAVO TANGO - Commenced awkwardly and lost ground but Ben Melham could offer no explanation for the poor performance. He told stewards that after being slow to begin he never travelled throughout and failed to respond to his riding in the straight. A post race veterinary examination failed to reveal any abnormalities and a swab sample was taken for analysis. "We probably didn't want to run her against Snitty Kitty," trainer Aaron Purcell after Lady Esprit at $51 defeated that mare at $1.70.